Mohnish Pabrai’s serve of devotion, dakshana and duty. 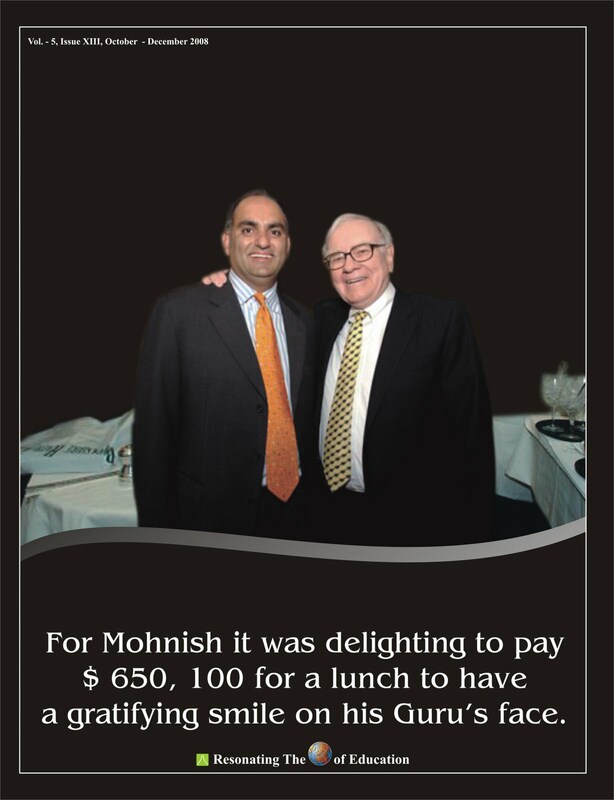 Mohnish pabrai has such a great admiration for his guru, Warren Buffett that he has bid for the last four years on e-Bay for lunch with him. He missed each time but the joint bid by pabrai and his partner Guyspier beat out others for the much awaited lunch, held recently on 25 June 2008. It was like giving a gift to his teacher on the Teachers’ day as celebrated in India. Mohnish is the founder and Managing Partner of the Pabrai Investment Funds, a group of focused value funds in California. 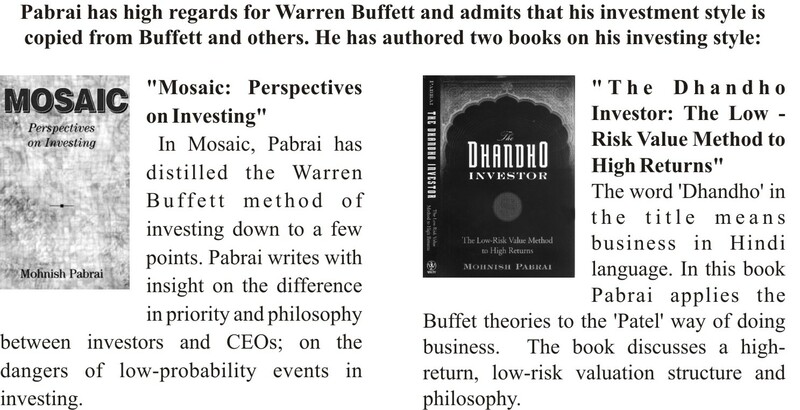 Since inception in 1999 with $1 Million in assets, the Pabrai Funds has grown to over $625 Million in assets in 2007. Pabrai invests primarily in smaller companies, those with a market cap in the half billion dollar range, that are out of favor. The Pabrai Funds are a close replica of the original 1950s Buffett Investment Partnerships. His investment philosophy is comparable to that of Warren Buffett in the early days of Buffett’s investing career. He focuses on a company’s intrinsic value. Since inception, the Pabrai Investment Funds have consistently beaten all the major indices and over 99% of mutual and hedge fund managers. Mohnish Pabrai was born on 12 June, 1964 in Mumbai. After completing the school education, Pabrai received a Bachelor’s Degree in 1986, from Clemson University in Computer Engineering, and graduated with senior honors completing the 4-year degree in 3 years. Mohnish is a visionary in both business and finance. He is admired for knowing when to start and when to quit. In 1990, he quit his job as an engineer for Tellabs in Chicago and abandoned his master’s thesis at the Illinois Institute of Technology to launch TransTech, a systems integration company, which he funded with $30,000 from his retirement account and $70,000 from credit cards. By 1999, Transtech, which had grown to 200 employees and $30 million in revenues, held no thrill for Mohnish. He sold it and got in to Buffett’s shoes. He became an unabashed fan of Buffett, imitating him in almost every sphere of work, including operating alone and unobtrusively to even out perform Buffett’s Berkshire Hathaway with establishment of his investment funds. Pabrai is the winner of the 1999 KPMG Illinois High Tech Entrepreneur award given by KPMG, The State of Illinois, and The City of Chicago. He is an active Member of the Young President’s Organization (YPO) and a charter member of The Indus Entrepreneurs (TiE). Mohnish Pabrai is among the most promising of a new generation of value investors। He strongly believes in a balanced life between work, family, and personal time. He is an eager student and a prolific reader on a wide range of subjects. He enjoys spending time with his wife, Harina and children, Monsoon and Momachi. Mohnish Pabrai has founded the Dakshana foundation to promote human welfare. It is a young philanthropic foundation focused on providing world-class educational opportunities to economically and socially backward children worldwide. Mohnish and his spouse, Harina Kapoor, are the principal benefactors of The Dakshana Foundation. They have targeted the 750 Million people living in India’s 640,000 villages. The Idea is to offer support to intellectually gifted and impoverished students taking the entrance exams for India’s elite technical colleges such as IITs। From $ 800 (the cost of one scholarship), he envisions returns, after the student graduates, of several million dollars in life long income. The beneficiary of aid today is the donor of tomorrow. 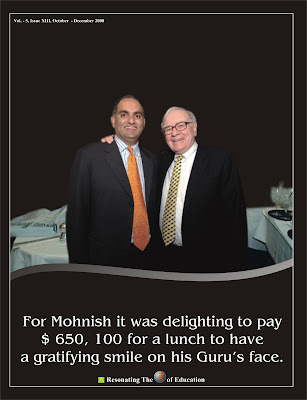 For Mohnish Pabrai, $ 650,100 lunch with Warren Buffett, worlds’ richest man was worth every dime. The fee for the lunch would go to the Glide Foundation, which helps the poor and homeless. Lunch with Buffett, Pabrai had figured, would be a good way to give to charity, but it would also be the ultimate capitalist master class — a chance to see up close and learn from his wisdom. Mohnish had brought along his wife and two daughters, for the lunch who sat on either side of Buffett. The eyes turn curious to take glimpse of history’s most expensive meal, served at Smith & Woolensky Steak house, NewYork “to pay a large tuition bill”. 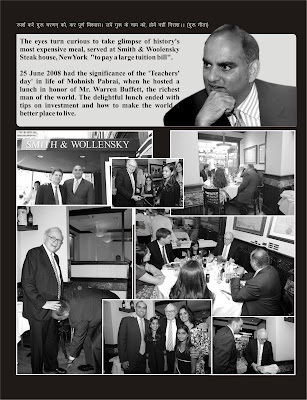 25 June 2008 had the significance of the ‘Teachers’ day’ in life of Mohnish Pabrai, when he hosted a lunch in honor of Mr। Warren Buffett, the richest man of the world. The delightful lunch ended with tips on investment and how to make the world a better place to live.